Vajragad was built on a small hill in the midst of the Vasai Campaign in Girij Village which falls between the Vasai and Arnala fort range. The main purpose to build the fort was to keep a watch on the coastal areas around Vasai and Arnala forts and to maintain a stronghold against the Portuguese. Currently, the fort is almost in ruins. There is a temple of Lord Dattatreya on this fort and hence, the fort is also known to be "Girij Dongri/Datta Dongri/Hira Dongri". The Portuguese started the construction of Vasai fort in 1526 A.D and gradually started bringing the nearby area under their regime. In order to reign over the adjacent areas a chain of forts were built at Shirgaon, Mahim, Kelve. The inhabitants of these areas were forced to convert their religion. In order to seek refuge from the injustice and forceful religious conversions, people sought for help from the Peshwas. In the year 1737 AD, Chimaji Appa formed a campaign - The Vasai Campaign, to fight out the Portuguese rule. Gangaji Naik, Shankarji Phadke, Baji Rethekar were among the others who made this campaign a success story. Vajragad is located on a small hill North East of Girij village. There are proper steps carved in to reach the fort. It takes 10 -15 minutes from the base village to reach the main entrance of the fort. Both, the bastions and the main entrance are in ruins. There are toilets built on the right bastion while the left bastion is covered with vegetation. To reach the left bastion one has to take a diversion towards left from the staircase. The main wall and bastions of the fort may have been built by placing huge rocks one upon the other. Since this fort was constructed during the war, there is hardly any use of limestone in the overall construction of the fort. The staircase takes us to the fort summit. 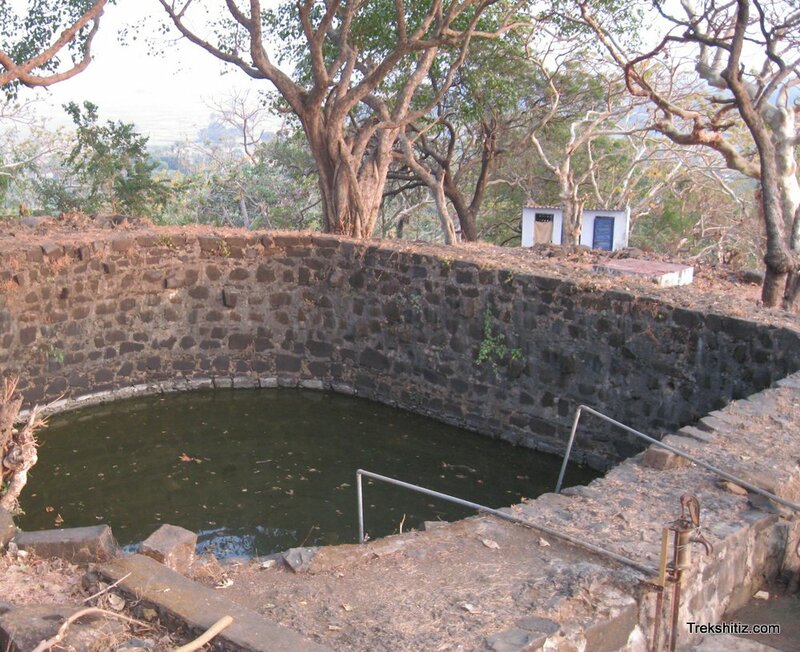 At the top, there is a square shaped water tank built in stone with ample of water in it. There is a temple of Lord Bhavaangadeshwar on the summit and a Temple of Lord Hanuman under a tree. From the summit, facing towards north, one can view Arnala fort, and Vasai fort towards the south. One also gets the view of adjoining areas around these forts. One can reach Vajragad from Vasai and Nallasopara railway station on the Mumbai Western Railway. Village Girij is 14 kms from Vasai and 8 kms from Nallasopara. One can take a bus or an auto rickshaw from Vasai West or Nallasopara West to the base village Girij. No accommodation facilities on the fort. None. Local villagers can make food available on request. Water is available throughout the year.